WARNING: Because browser and printer settings vary, you may not get an exact copy if you choose to print out this article from the web. To print this article out as an exact copy, click on the fish. where you may download a free Acrobat Reader. Overshadowed by modern hybrids, old roses have been neglected in this century; but now there is a renaissance afoot to restore the older varieties to their place in the garden. Their historic interest, color, fragrance, and form should make old roses as indispensable to today's gardens as they have been for centuries. Many gardeners will attest that the best thing about old roses is that many of them provide all these landscape values without becoming a maintenance burden. The American Rose Society defines the term 'old rose' to be varieties introduced prior to 1867. Others consider any variety that has been in cultivation for 75 or more years, or varieties having old rose characteristics of flower form, color, and fragrance, to be old. Long before its extensive hybridization, the rose had survived cheerfully in the gardens of history. Early rose cultivars retained the resilience and fortitude programmed by nature, but these qualities have sometimes been neglected in modern hybrids developed primarily for showy blooms. Unlike modern roses, which often grow poorly without many hours of devoted attention, most old roses will give today's busy home owner an appreciated rest from much of the heavy fertilizing, spraying, and nurturing demanded by their younger cousins. Some old rose varieties actually prefer a minimum of pruning. And, as specimens found in old cemeteries and abandoned home sites attest, many have survived even without care from human hands. Old rose varieties tend to be stable, long lived, and sturdy, especially when grown from cuttings. Many show a strong resistance to black spot and other diseases. The unforgettable 'true rose' fragrance lives in its undiluted form in old roses; such richness and diversity of fragrance are not found in the modern hybrids. Old roses have an inherent beauty of form, a quality which does not diminish over the years. This makes them especially useful as landscape plants. Colors in old roses tend to be more muted and pastel than in modern hybrids, but many collectors acquire a preference for the softer hues. Some varieties display handsome foliage, while others set attractive hips in the fall which can be harvested for their Vitamin C content. Roses were historically planted for garden display as much as for cut flower use. Species roses and early hybrids were more shrub-like, and tended to be more insect- and disease-resistant than their modern cousins. Old roses occur in many shrub and vine sizes, making them truly versatile plants. A brief look at some of the ways old garden roses have been used in landscapes of the past can suggest possibilities for today's gardens. Trellises can be attractive structures themselves, and with the addition of climbing roses, the effect can be spectacular. Ready-made trellises are usually skimpy and out of scale in the landscape. Treated pine, redwood, cedar, or similar long-lasting woods are appropriate for trellis construction. Sometimes a frame can be built, then 4- by 8-foot modules of prefabricated trellage used to finish the design. Roses can be used for espaliers on the walls of various structures. It is important that roses receive plenty of sunlight and have good air circulation. Walls limit both of these important commodities, and may result in problems with mildew, blackspot, and spider mites. Select varieties that have some resistance to these problems, to increase your chances for success. Climbing roses trained around windows or over doorways can be especially attractive. In England, roses are sometimes trained on a wall, and allowed to grow on trellage placed on the roof. Only the hardiest roses, however, can tolerate the sun and radiated heat of our Texas summers. Consider some of the species climbers and exceptionally hardy hybrids such as 'Cecile Brunner', 'Lamarque', 'Lady Banks', 'Fortuniana', and 'Zepherine Drouhin'. Rose hedges can be quite beautiful, but are best used sparingly because of their relatively high degree of maintenance. They are best when shaped periodically but not clipped as one would treat boxwood or privet hedges. Sunny locations and good air circulation are needed to successfully grow rose hedges. Relatively low hedges of 3 to 4 feet can be maintained with some of the Polyantha and China roses. 'Marie Pavie', 'La Marne', 'Old Blush', and various red Chinas are good choices. Hybrid Musks are useful where 5- to 7-foot hedges are appropriate. 'Ballerina', 'Penelope', 'Cornelia', and 'Belinda' are good prospects. For really large hedges, some of the species roses are good. The white or yellow form of Lady Banks makes huge mounding plants 15 to 20 feet in diameter and 12 to 15 feet tall while requiring little maintenance. Thorny roses such as 'Mermaid' and 'Cherokee' may be used to form an impenetrable hedge while affording habitat for various bird and animal species. Staggered plantings, rather than straight rows, are more appealing if sufficient space is available. Roses for hedges may be spaced as closely as 2 feet apart for small types and 10 to 12 feet apart for Banksias, Mermaid, etc. Although it is usually best to use only one kind of rose in a hedge, interesting effects can be created by using several types. When this is done, it is usually more satisfying to use three or more of a kind together. 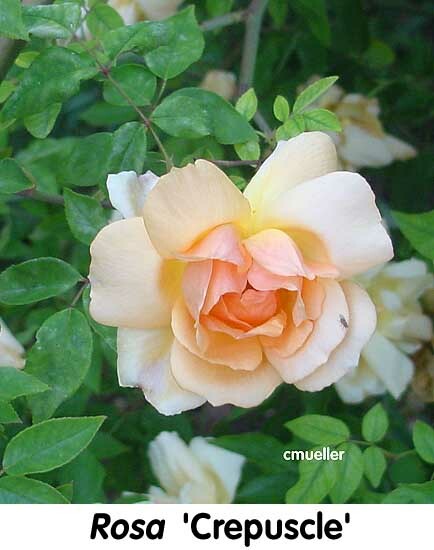 An occasional large rose specimen in a shrub border can be effective. Also, a number of specimens can be used in a lawn area. Large specimens can also be used to screen unsightly areas or to cover dead trees, stumps, etc. Some roses have a distinctive weeping form. 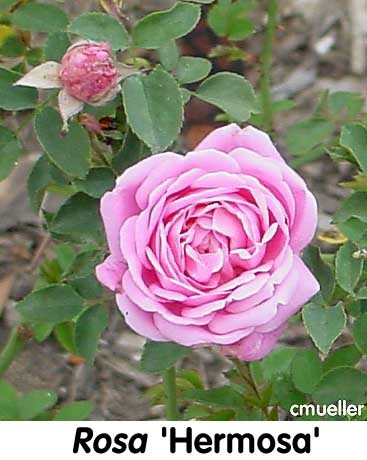 The 'Swamp Rose' is a good example, and can be used effectively as a single specimen. Arches can be among the most dramatic garden features. Logical locations are at the entrance or exit to a garden area where a path runs beneath. It is critical that the arch be in scale with its surroundings, and be built of compatible materials. Ready-made arches sold by mail are often too small to fit into most settings. Sufficient height and width must be allowed to accommodate the drape of the rose or other vines used. The foliage of the rose is equally as important as the flowers. Stiff-caned woody climbers are not nearly so effective on arches as they are on fences and walls. For arches, consider Noisettes, climbing Teas, and various ramblers. Pillars of roses can be used to frame a garden or as specimens. The pillars themselves are often made of rustic woody limbs, allowing stubs of branches to support the vines. Victorian gardens sometimes connected pillars with chains on which rambling roses were trained. Three rustic posts may also be arranged teepee-style and lashed or nailed at the top, to provide an interesting effect when covered with roses. 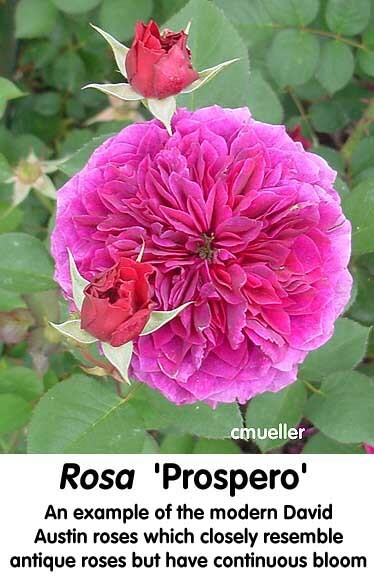 An umbrella-shaped trained rose can also be interesting, and is achieved by training a climbing form, such as 'Cecile Brunner', up a central column and out over an umbrella-shaped support. A garden pergola can also be called a covered alley. Such structures are fairly common in large formal gardens, and can sometimes be used in today's residential landscapes. In small gardens, pergolas can be shortened to 2 or 3 posts, making them deep archways. Pergolas are most effective on level ground in straight lines. They can be arranged in a cross, with each path leading to separate gardens. Pergolas may be constructed of rustic timbers, iron, finished wood, or a combination of brick and the previously-mentioned materials. I have also seen them created from concrete designed to look like rustic timbers. The path beneath can be grass, stone, brick, or gravel. Ever-blooming roses may be alternated with once-flowering types or a single variety for maximum impact. Most ramblers or climbing roses are appropriate for use on pergolas. Loose shrubs and trailing roses are sometimes used on banks and other sunny locations as ground covers. Keeping such plantings weed-free while they are becoming established is often a challenge. Heavy mulching can help. Some of the Wichurianas and other ramblers may be used in this manner. Certain of the species roses, such as the Banksias, Swamp Rose, and R. Fortuniana, can be very effective when allowed to tumble over a wall, especially if there is a pool of water below. One of the most traditional and effective uses of old garden roses is in wide borders mixed with small flowering trees, shrubs, perennials, and annuals. Groups of three or more of a variety are usually more effective than single specimens. Care should be taken to allow enough air space around the roses for good circulation, which will help prevent foliar diseases. Teas, Bourbons, Polyanthas, Chinas, Hybrid Perpetuals, Hybrid Musks, Noisettes, and many of the species roses all lend themselves to use in mixed borders. By carefully combining roses with other ornamental plants, striking combinations that can produce color over most of the year can be easily achieved.